It’s not easy to be a nimble marketer in today’s ever-expanding, increasingly real-time digital world. But a growing number of brands and agencies are able to make decisions about customers, products and markets more quickly and thoughtfully by revising and updating their approaches to processes, technology, people and partnerships. Real-time marketing has roots in the world of social media, but as almost all marketing goes digital, the urgency of real-time extends to all facets of the marketing practice. 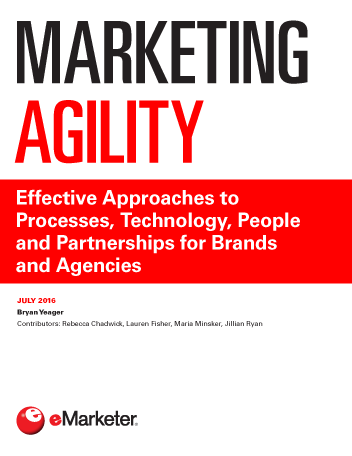 Factors like shortened cycles in seemingly every aspect of marketing from ideation to execution, as well as closer collaboration with product and tech teams, are prompting more brands and agencies to adopt principles from the Agile methodology, which is most prominently used by software developers to prioritize and manage marketing initiatives in an always-on world. Marketers today are striving for more tech- and data-driven operations in their pursuit of greater responsiveness to customers and markets. But to effectively harness those signals and systems, training, new talent, culture and structure may also have to be revised or updated. Agency and partner relationships remain critically important for brands, which often believe closer collaboration will make for more agility. Brands are also opening up to working more closely with nontraditional marketing partners, including digital publishers, to engage audiences in new ways, as well as innovation consultancies to help stay ahead of the tech curve. "CMOs worldwide made marked progress in managing their increasingly complex roles, shifting consumer demographics, the rise of social and the explosion of data between 2013 and 2015, according to a February 2016 IBM report."